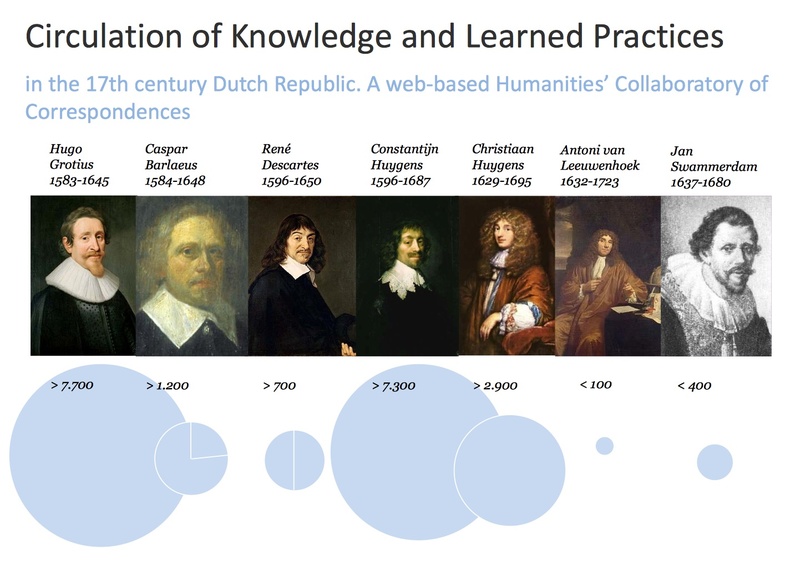 Circulation of Knowledge and Learned Practices in the 17th-century Dutch Republic (CKCC) investigates the circulation of knowledge in the 17th-century Dutch Republic. A multi-disciplinary project team consisting of historians, literature researchers, linguists and computer scientists works together in this project and created a web-based Humanities’ Collaboratory on Correspondences. This project, is carried out thanks to a NWO Medium investment subsidy and with CLARIN subsidies to make the resources available withing the CLARIN domain. A consortium of Dutch universities and cultural heritage institutions is building a web-based collaboratory (an online space for asynchronous collaboration) around a corpus of 20.000 letters of scholars who lived in the 17th-century Dutch Republic to answer the research question: how did knowledge circulate in the 17th century? Hereto, it will be necessary to analyze this large amount of correspondence systematically. Based on this (extendable) corpus, we will implement a content processing workflow that consists of iterative cycles of conceptual analysis, enrichment with several layers of annotation and visualization. With advice from CLARIN-EU in the first stage of the project a demonstrator was developed which implements techniques of keyword extraction. The second stage consists of evaluating existing more complex tools en techniques that can tackle one or more aspects of the targeted grammatical, content-related, and network complexity analysis, annotation, and visualization. The phase shall identify a set of tools that can be readily utilized in CKCC, as well as tools that need to be adapted or extended to the needs of CKCC; in short, by the end of this phase resources, requirements and risks shall become clear (deadline: December 2010). In the third stage the collaboratory is further developed according to the description in the CKCC project goals, centering around the technique of concept extraction. These three stages constitute the Work Package Analysis Tools, the core of the CKCC project, which was supported by CLARIN-NL. Other Work Packages provide data and software tools needed to create a complete system: the digital corpus of letters (WP6), the editing collaboratory that will contain the letters (WP1), and the archiving environment for data and software (WP2).